Last September I attended the “Rethink! Internet of Retail Minds” conference in Hamburg, which gathered top companies and individuals involved in smart retail and e-commerce solutions. During this event, I facilitated the experts’ discussion panel on legal and privacy challenges of the new solutions and this article presents the key takeaways of this discussion. 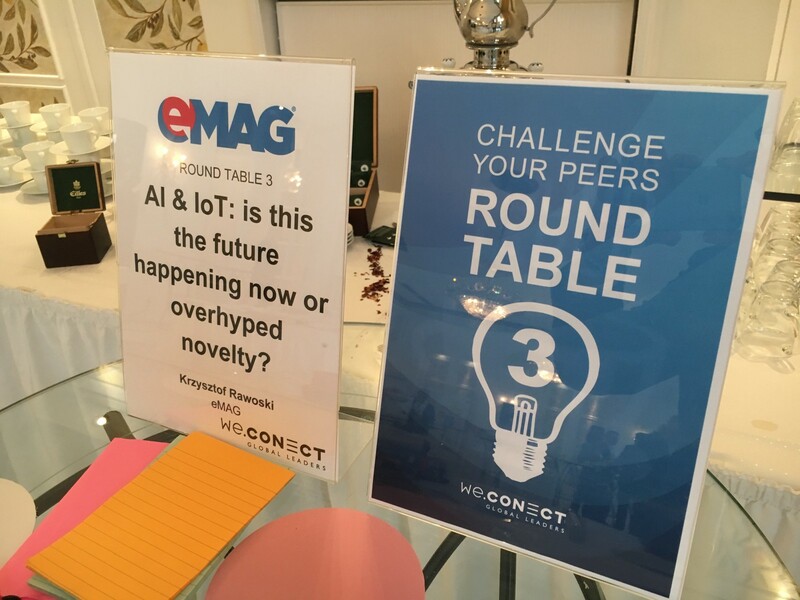 The goal of the conference was to bring together top retail and e-commerce companies with innovators and startups working on the newest Artificial Intelligence (AI) and Internet of Things (IoT) solutions. Two and a half days were packed with presentations, case studies and networking events. Hamburg was chosen because its top position in Germany (and leading in Europe) in terms of entrepreneurship, especially the one related to bleeding-edge technologies. Attendees listened to and met top executives and the smartest engineers in the industry coming from every part of the globe. The conference followed the model, which I find interesting: the agenda consists not only of talks and workshops, which you know pretty well from every other such conference. There are also events designed specifically to enable attendees to discuss, exchange their opinions, share knowledge and experience. One of such formats is called “Challenge Your Peers”. I was invited by the organizers to facilitate a discussion on the topics I find interesting, as long as they were related to the conference theme. Together with other moderators we presented our topics beforehand at the main scene, and then conference participants were encouraged to join the chosen discussion table. My role, as the facilitator, was to get the meeting from beginning to the end: kick off the discussion, encourage participants to engage and share valuable ideas, then make notes, summarize and prepare written conclusions for the conference materials. Our discussion table was joined by around ten people from different backgrounds: there were members of “classic” retail industry, e-commerce representatives, employees of both startups and international corporations. Most of them had some experience with AI and IoT in their work: ranging from data analysis to autonomous cars development. So this was a great team to have this conversation. As I could freely choose the topic, I decided to be a little bit controversial, taking into consideration the theme of the conference :).I wanted to ask, if AI and IoT are really the “future happening now”, or just buzzwords, the same as “dotcom”, “Web 2.0” or “year of mobile” some time ago. Then I wanted to discuss about adoption of both concepts and problems of privacy and ethics, that arise when artificial intelligence and smart devices move from laboratories to our customers’ homes. I wanted this first topic to be short introduction to AI and IoT, to make sure that all participants are on the same page and understand what we will be talking about. It turned out, that this was very interesting — and longer than expected — discussion, great kick-off for our meeting. Focus of this part was to learn, if AI and IoT are very new to the industry, or well known, but packaged differently. We had a great insight from experienced engineers, who worked on AI and big data already 20 years ago, when it wasn’t that much hyped as now — it was just boring number crunching by mathematicians and analysts. The conclusion was that AI (especially Machine Learning) is nothing new — the algorithms that we use now were developed many years ago. They produced data to help humans make a decision. The new trend nowadays is to shift decision-making as well to the AI-powered solutions. Current popularity of AI and IoT comes from the fact, that both computing power for AI (Machine Learning) and hardware for prototyping became the cheapest and more accessible than ever before. This encourages individuals and startups to learn quickly, experiment cheaply, try new solutions and possibly create new products. Interesting insight, mentioned especially by business people, was that IoT and AI are seen now as technical challenges, which causes current solutions to diverge from the business needs. It is essential to get back to the business end of the problem, think about what problems must be solved, prepare business cases and act upon them. This should be achieved by forming interdisciplinary teams — not only engineers, but also business people, human interaction designers and so on. It is crucial for the business success of such innovative solutions. First part of our discussion was mostly exchange of experience and knowledge, without much controversy or emotions. It changed instantly when we went to other two topics, beginning with privacy in the world of AI and IoT. It is well known, that Machine Learning solutions are based on crunching lots of data collected from millions of users. Top corporations such as Google, Facebook or Apple store unimaginable amounts of personal information about most of the Earth’s inhabitants. They are listening to us, reading our mail, know where we are and making decisions for us. The question is: should we — as customers — be happy about that, or should we resist? And, on the other hand, as companies who deliver AI-backed services, how we should explain to our customers, what we do with their data? Very early on we agreed, that it is hard or almost impossible to use modern services such as the internet, smartphones, online shopping, etc. without sharing information with some companies. One of the participants even called users being “slaves” to the big corporations, because they have to give up their privacy to exist in the current world. We agreed, that personal information is the modern currency, which we exchange (reduce our privacy) for services, tools and other benefits, that are served by companies collecting, processing and selling this information further. Other concern, that was discussed is that regulators are not reacting quickly enough to the changes in the industry, and when they do — the legislation doesn’t help the customers. One example of such regulation is the “cookie disclaimer”, which brings no protection or any other benefit to the users. Other example, that we discussed for some time, is GDRP (General Data Protection Regulation) — new legislation that will be enforced from May 25, 2018 and is greatly impacting how personal information is being collected and processed. General conclusion was that GDRP will be nuisance, but won’t change much in the extent of data collected or processed by the companies. The problem of privacy is increasing and regulators need to step up. As a separate thread, we looked at the problem from the perspective of the companies that are collecting the personal information. It was unanimously agreed, that we are heavily responsible for making the information secure and explaining to our customers, what, why and how we are processing it. Ethical approach is a top priority. Also, there’s very thin line between being helpful and creepy, invasive — it shouldn’t be crossed at all cost. Ethical implications: who is responsible for the decisions made by AI? This topic turned out to be the most exciting: we couldn’t finish before the end of the session — it continued afterwards. It also caused most disagreements — it was impossible to reach joint conclusion. The question, that I posed at the beginning — “who is responsible for the decisions made by AI?” was really hard to answer. Some of the participants offered their opinion, that creators of AI-powered devices (such as cars) should be held solely responsible for the decisions. Others argued, that in some situations the negative outcome is inevitable, such as in problems posed by MIT Moral Machine test, so there’s no real liability in the criminal meaning. We discussed about the randomness of human decisions. When the information or time is limited, people are forced to make decisions that are random — it happens on the road or operating table and is treated as inherent human nature, sometimes giving comfortable explanation of harm or loss. Should that randomness be implemented in the decision-making process? If not — how to explain the negative outcome of some situations? These questions were left without clear answer — they only led to multiple new challenges. Then I asked a question if we really want to allow AI to make life-or-death decisions, or just process the information and hand it over to humans to decide? One of the participants claimed, that AI will never be as intelligent as human being, so we shouldn’t let it make decisions. Other participant reminded of the singularity hypothesis promoted by Ray Kurzweil, which states that Artificial Intelligence will greatly surpass at some point human intelligence, and will escape with the pace that we won’t be able to keep up. Kurzweil claims, that this point in time will happen in 2045. At this point the discussion was boiling hot, but we had to finish due to time constraints. The most important conclusions were that privacy and ethics in IoT and AI powered business, and everyday life in general are still greatly unexplored, sensitive topic. There are lots of different approaches, now mainly dictated by the big corporations, with science community and legislators trying to catch up. The time is running out and we need to have them solved now, as sooner than later our lives will change greatly, with computers doing more and more work for us and surrounding us everywhere. 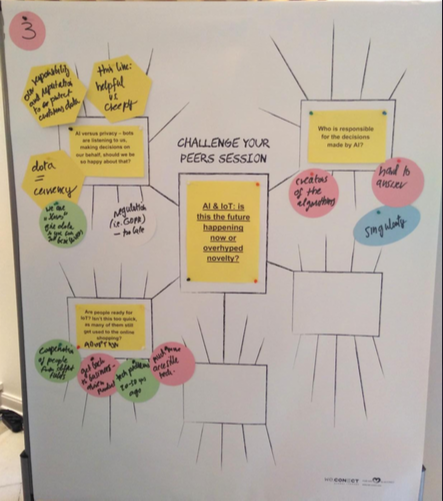 The goal of the “Challenge Your Peers” format was to ask questions, spark discussion and exchange ideas, so I was happy with the outcome: we left with many new questions, but also learning about other peoples’ perspective, sometimes completely different than ours. This is also the purpose of the article you are reading right now — to show you the questions so you can think about the answers by yourself :) I encourage you to share your thoughts in the comments section below. Web apps expert, fan of new technologies.